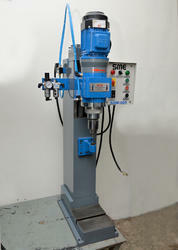 We are a leading Manufacturer of utensils riveting machine from Faridabad, India. We are prominent manufacturer and supplier of optimum grade Riveting Machine. Riveting machines are manufactured using supreme grade material and sophisticated techniques under the visionary guidance of trained professionals. Further, riveting machines are widely used for joining material together or automatically squeezing. Further riveting machines are checked on different quality parameters before being dealt to our clients assuring their flawlessness at user's end.